These pastures are part of the Kimberley red soil group - not spinifex pastures, and limestone grasses are the identifier grasses. Use the interactive key to pasture condition to help identify pasture type. Evidence suggests that many arid short grass pastures are capable of supporting healthy stands of perennial grasses more characteristic of ribbon grass pasture, if spelled to allow recovery. Ribbon grass pasture is a more-resilient and more-productive pasture type than arid short grass pasture. Pastoral value for arid short grass pasture is moderate, but resilience is low. 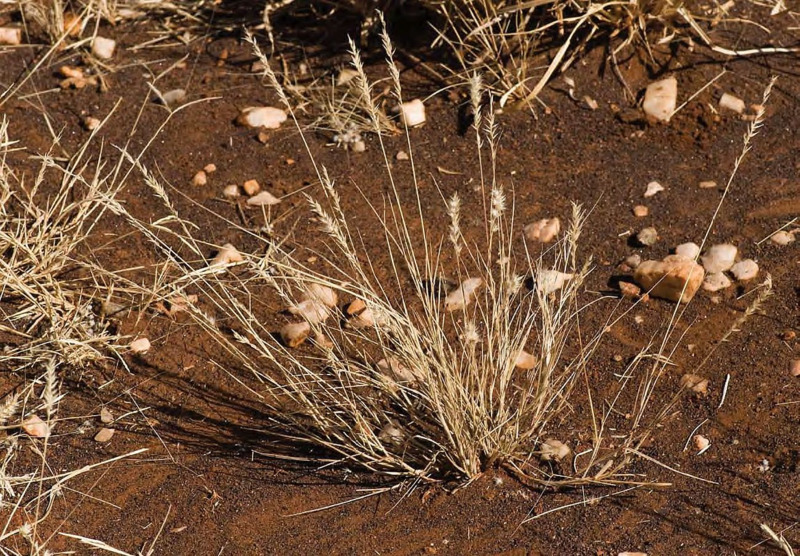 Though annual grasses, such as limestone grass and Kimberley couch, can provide good feed for livestock early in the year while still green, their bulk is variable. In below-average rainfall years, very little annual grass may be produced. The small patches of the long-lived perennial grasses supply the bulk of the feed for the rest of the year. Limestone grass and some other robust annual grasses can act as short-lived perennials under optimal conditions (a run of good seasons). Arid short grass pastures are grasslands dominated by short-lived perennial or annual grasses with scattered eucalypt trees. They occur on level to undulating plains. Soils are variable depth loams (sometimes calcareous) and the surface may be stony. The occurrence of these pastures is often the result of a transition within ribbon grass pastures following sustained overgrazing. Good: Limestone grass is usually dominant when this pasture type is in good condition. Purple nineawn, an intermediate annual grass, may also be common. Plants are robust and vigorous, and bare ground is minimal unless pasture is grazed down. Some perennial grasses, such as ribbon grass, wire grass, white grass and black speargrass, may be present as sparse, isolated plants or scattered small patches. 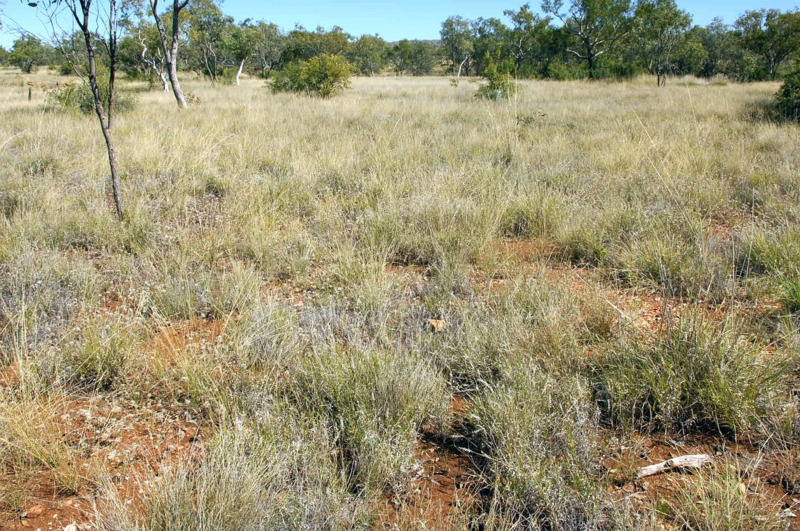 Figure 1 Arid short grass pasture in good condition in the Kimberley (photograph taken May 2008). A There is a dense coverage of limestone grass (a desirable species) and other annual grasses. B Undesirable species, such as threeawn, are sparse. C Desirable perennial grasses, such as ribbon grass, may be found; groundcover is optimal for the site. Fair: As pasture condition declines from good to fair, intermediate annual grasses, such as bunched kerosene grass, become more common. Limestone grass is still prominent, although the plants are likely to be less vigorous and bare areas may be visible. Less-palatable perennial species, such as wire grass, white grass and black speargrass, may still persist. Figure 2 Arid short grass pasture in fair condition in the Kimberley (photograph taken May 2008). A The desirable limestone grass is still common, though its vigour and density are reduced; here it makes up about one-third of the stand. B Intermediate annual grasses, such as Kimberley couch, make up at least one-third of the stand. C Undesirable species, such as threeawn, are increasing. D Black speargrass, a less-palatable perennial grass, persists. Poor: Further decline towards poor condition is signalled by large areas of bare ground and increased presence of unpalatable annual grasses, such as threeawns. Remaining perennial grasses are much reduced in vigour. In areas adjacent to hard spinifex pastures, hard spinifex may colonise the bare areas. Figure 3 Arid short grass pasture in poor condition in the Kimberley (photograph taken May 2008). A There are large areas of bare ground developing; desirable annual grasses are absent. B The remaining perennial grasses are isolated and show poor vigour. C There is an increased presence of rice grass, a coloniser of degraded areas.